A bird flying into the clouds. The meeting with the Episcopal bishop the day before my operation went very well of course, and I continue my gratitude for circumstances that led to his blessing at such a time. Bishop Price is a jovial man with a highly developed sense of humor about himself, a characteristic I especially prefer in the holy men of my acquaintance. :-) He conducted our Easter season service in a resounding voice of allelulia. He was at Good Shepherd to welcome and confirm a number of us new members, which has been a very important decision for our family. Both of Dana's parents have been Lutheran pastors and so she has made this move thoughtfully. When it was my turn to step in front of the congregation and kneel before the Bishop, he took extra time to pronounce healing blessing upon the hospital experience to come. The blessing bore fruit immediately for after the service, coming up to me was the director of one of the shows of the Ohio Valley Summer Theatre. There usually are 2 plays offered every summer, each running a couple of weeks, and since all the facilities of Ohio University's drama department are available the production generally is top-notch. She asked my son Jeroch whether he had mentioned to me the part for which she hoped I'd audition. Well, he hadn't, so she urged it upon me now. The play is called Jabberwock and is not connected with Terry Gilliam in any way, and she was hoping I'd take the part of Grandpa Fisher. Hmmmm, not the romantic lead obviously. I explained about the surgery. That's OK, says she, why don't you audition just for the fun of it? When would that be? In an hour. So there I went, still in my confirmation suit and bedecked with a bouquet of flowers, into a theatre situation where I strutted some stuff briefly and enjoyed a little improvisation. The play looked to be a presentation of some stories by James Thurber, but my mind really wasn't on researching it or anything. It was a nice compliment, on that day, to be noticed and invited. The lady from Fairfield Medical Center, a not-for-profit hospital of very good rating, had suggested we arrive Monday morning, May 3rd, at 6 AM. The place provides free motel facilities for relatives in situations like ours, and the Nursing Department needed visiting first, so Dana could get her key. That done, we had been told to report directly to the Surgery Waiting Area. There sat 4 or 5 other anxious looking families, and I tried not to get caught up in that stress. At about 6:30 my name was called and in I went. The nurse was a lovely person and perfectly efficient. She got my height, weight and vitals, and I proceeded to strip down and put on the hospital gown that would be my fashion statement for the next 4 1/2 days. Then she interviewed me about my entire medical history, including this development, and asked what I was there for. Fortunately I was coherent through all of this, but confessed creeping fear as I watched other gurneys pass by and through the doors. Dana came in to get my clothes, pay our respects and share our love, before returning to that waiting room, where she would be for the next 6 1/2 hours. Now came in the anesthesiologist, a physician of an appropriately sardonic tone...which I was able to match, so we hit it off well. My friend Caroline, in Scotland, had suggested I make special efforts to relate with this person, as he will be at the controls through the whole thing. I asked him if he would be around when I woke up, and he gave me lengthy assurance about that. Like everyone else I would meet in the next half hour, he wanted me to confirm what I was there for. I told him I never had been in a hospital before...for anything, and he said, "What! That's unAmerican! Here we have the real reason you finally are here today: Homeland Security has caught up with you." I reached over and spoke into one of the 2 IV inlets the nurse simultaneously had been depositing in my hands. I murmured, "Did you hear what he just said, Agent Grimes?" He laughed, Dr. Batten came in, and both doctors planned out exactly what was going to happen, right there in front of me---and seemed to include me in a way, as if asking for permission. I liked this whole part of it...but now I could detect some relaxant had been hooked up and was going in, and so I prepared for the journey. One of my dearest friends had advised me to visualize an initiation into a higher spiritual plane, where all the healing of this operation is to be welcomed. I was wheeled into surgery, boosted myself onto the table, and greeted each of the people who were introduced by name. One of them asked what procedure I was there for---and somehow, despite the medication now kicking in, I think I pronounced prostatectomy correctly. When the mask was applied I was gone on the instant. I came to in the recovery room amidst too much activity I thought, but I'm glad things were as lucid as they were. The anesthesiologist checked me briefly before handing me over to nursing. It seemed I had been brought in with a smooth landing. There I lay for 2 or 3 hours probably, while various readings were done, and generally I just rested maybe dozing in and out. At some point I was wheeled up to the 4th floor and into a room I shared with another surgery patient. Dana, who had been talked with by Dr. Batten immediately after the operation, had had to wait all this time, but now arrived with me. From that point, despite her own exhaustion, she was on the alert like a hawk. Her instincts tend to be more suspicious than mine, but in a hospital stay, I would learn, extreme caution really is warranted. My diet was ice chips, and these were provided copiously. I had a tremendous sore throat and so they were welcomed. I think a tube had been placed down there as some safety feature, but the irritation was intense. I was worried strep had gotten in. They provided a breathing exercise device, and a respiratory therapist taught me how to use it. Until I could begin a more active upright lifestyle, nothing is more important than keeping liquid from collecting in the lungs. The next day I was offered the opportunity to walk. I had been expecting it and I wanted to try. The pain-killer was doing well. A friend at church had identified himself as having had the surgery a couple years ago, and he was encouraging although he cautioned, "It's no cakewalk." He said the first time he tried to walk he was overwhelmed with how exhausted he quickly became. This was my experience too. With Dana on one side and a nursing assistant on the other, I soon discovered I had chosen too fast a pace...and I had to sit down and rest. But each time it became easier, and I knew that walking a lot was the key to getting out of there. When I did hospital work in the '60s we learned that you never want the patient to get too comfortable in there. A person should come to hospital to get sick and learn the path back home. Maybe at one time hospitals were a rest spa away from home, but that's not the case these days---at least for the average guy. I never watched the hospital soap operas, but I did grow up with Dr. Kildare on radio and television---if not the movies. My mother was a nurse, who presented a very cozy view of what a hospital was in the States in the '30s and '40s. I loved the movie Not As A Stranger so much that I read the book, and briefly considered becoming a doctor myself. If Robert Mitchum could become a doctor, I sure as heck could! The media presentations of a hospital include the ongoing ringing of little chimelike bells, which are some kind of calling code I guess, and the ever present friendly voice paging a physician from one place to another. I think hospitals were like this at one time. Even visiting in one, you could hear an impression of a network of activity and people---responding to needs. But now the computer has arrived. I was connected to a machine that beeped, to be sure---and just heard by itself, it was reassuring. However, all of the machines met in various hubs out on the floor, and that noise was among the most dissonant I've ever encountered. There was no rhythm or harmony to the beeps in the hallway. It was loud and 24/7...and when someone got some air in a line, which happened a lot, the resulting din was enough to send a weaker soul on to his Maker. I couldn't imagine working in that noise, for it is worse even than a McDonald's drivethrough, which previously I considered the worst sound environment for a workplace outside a factory. In both situations you have health and nutrition involved, and the energy of these random computer noises is poisonous. If the soundscape was part of the plan not to make me too comfortable in hospital, it worked. I became intent on getting discharged. To make matters worse---or, to be more specific, less human and more isolated---the main "nursing" station seems to be populated with various clericals and paraprofessionals. The physicians answer their beepers there and write orders. Each nurse is positioned among the 3 or 4 rooms of her assignment, with an individual desktop and writing desk to connect her with the various others managing each case. In turn, she has a nursing assistant, each of whom now is armed with her own palm pilot. She is to review each computerized chart and jot onto her device the various orders that apply to her duties. Maybe all this is foolproof, but I tell you I became increasingly anxious about the whole process. I quickly discovered the urgency of making personal contacts with nurses and assistants who seemed responsive. I needed to find at least one person on each shift to whom I could turn to find out what was going on with me. For instance, I was on that unit for 3 full days before I discovered an order had been written for application of Neosporin to a cleaned catheter and the part of my body into which connected. It had evolved that it was being done sorta randomly, and like most of the procedures left up to the patient if they could get you to do it. As with so much of what else is happening to our society in the US anyway, you can find fewer and fewer workers who will accept responsibility for helping you really. That responsibility means finding out thoroughly what the problem is to be solved and how to manage it. It is to enjoy that engagement and the relationship with you that grows out of it. But today, unless you're a celebrity I guess, people seem increasingly to have their minds actually on something else---something that will happen after work sometime, or maybe a career advancement that can be accomplished mechanically somehow. When Dana came in on Thursday, she noticed at once that my mood had gotten aggressive, and so I suggested she observe how many of the easily 50 workers on the unit just then actually were doing anything physically with a patient...or even talking with one. The last couple days and nights I walked the halls many times, and I must say some staff exchanged very helpful pleasantries with me. But probably half never acknowledged my existence---and even wore an attitude of hurried hostility. And so it is, that so many of us are here on the planet, just coming and going. By Wednesday night at last, I got a clear liquid diet. Never has a cup of bouillon broth been so welcome! 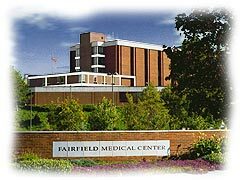 Thursday afternoon a normal diet was resumed, and again Dana accepted the free accommodations at Fairfield Medical. Friday morning I packed up, and we drove the hour home just after noon. The pathology on my case shows there was a small tumor on that prostate, but no evidence of spread into the lymph system. Since the cancer was on the surface of my gland, we'll need to maintain watchfulness in the event any cells spread to surrounding tissues. I see Dr. Batten again on Wednesday, when some adjustments hopefully will be made. If all goes well, I can have the catheter out in another 3 weeks...and real recovery can be enjoyed. Oh yes, about that play. As expected, the director was on our voicemail when we got home. She is enthusiastic about my taking that part. Last night I agreed to attend a reading of the script. The play is fantastic and brilliant...and just what the theatre doctor ordered! I'd love to be in it and I can't imagine a better therapy...even though rehearsals are starting now. Grandpa turns out to be one of the true zanies of the oldtime screwball comedies---a guy who leads the entire cast into an attack through the audience as he brandishes a saber. And yet he can resume perfect calm and rationality apparently at will. I wonder if they have an auditorium out at that hospital. loved your description and felt I was there with you. I send you energy every day and I KNOW you will have a full and speedy recovery. I think the play is just the medicine you need. How has Dana coped through all this? that you're up and about Tresor ! Funnily enough - Caroline was asking me only this morning if I'd heard any news about how you were keeping ! So glad to see you back - you seem to me to have as much (if not more) energy than ever ! I'm glad you decided to write about your experience. Love to you. 10 May 2004 @ 11:33 by shawa : Love from me too! keep thinking those good thoughts! I've been worried about you, reading what was going on in your life and all. Then you disappeared off the screen and I said to myself, "There goes yet another one that I will not get to know." Now you're back, HE'S BACK! If we could only know the width and depth ov the love we receive from those we know. It really is good to see you back. Hey, Richard, I've been thinking to take my little dog down to the pound...to visit the "prisoners" but I don't have any dog tags for him. What will they do to me...or worse...to my dog. Will they fine him...or me? Or will they arrest him...or throw both ov us in the pound? You don't need to worry unless someone takes pictures and puts them on the Internet. Oui knead smore keen obSERVERS such as U have demonstrated N this log. Does Ming the King reed beetween the by lines? Yule kneed 2 akst Hymn. Me thinks he is one ov the most POPular Mechanics. "There is Power in the Blood." Just so there're no cancer cells in there, I'll be happy. 18 May 2004 @ 10:06 by celestial @131.191.56.165 : "Trust and Obey"
yAll knead just one speck ov faith. Smaller even than a mustard seed. 19 May 2004 @ 11:19 by celestial @131.191.56.165 : "All Hail the Power"
20 May 2004 @ 09:32 by celestial @131.191.56.165 : "Give ov Your Best to the Master"
"Throw your soul's fresh, glowing ardor Into the battle for truth..."
the daily prayers, Celestial. Thank you. 21 May 2004 @ 09:32 by celestial @131.191.56.165 : "Faith ov Our Fathers"
Faith ov our fathers! we will love Both friend and foe..."
22 May 2004 @ 11:20 by celestial @131.191.56.165 : "Just As I Am"
"...Thou wilt receive, Wilt welcome, pardon, cleanse, relieve..."
23 May 2004 @ 07:47 by celestial @131.191.56.165 : "Precious Memories"
"...As I ponder, hope grows fonder..."
But I wonder, how far yonder? in a heart that hears. and let there be musik, JAZZ musique!